(ie win / draw / losses) but only those over 60 ply. max book depth is 15 moves. can anybody make a tournament to test which of these all is the best book ? A Learning purpose opening book for Arena 2.0 GUI Developed by ChessKnight. - It contains 3,020,202 moves and all most all major tournament opening maximum upto 60 ply. - This is a broad comprehensive opening book designed to reflect current chess modern opening theory. - Copy OpeningVariety.abk in the directory of Arena Book . 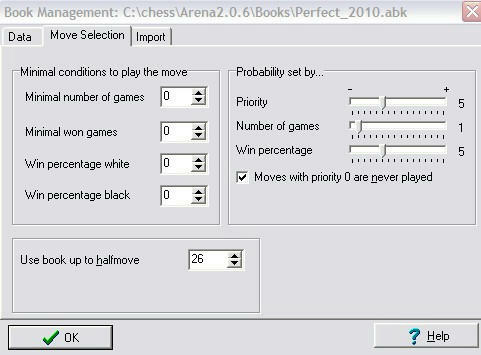 - From "Book->manage" menu, Select OpeningVariety.abks and load this book with chess engine of your choice. - You may select to play white to see variations, or you may play white as well. - A greater variety of play can be introduced by various combinations in percentage slid bars by tweaking default settings and varying probability figure. Select:"Move with priority 0 nerver played"
* contains 219.639 moves. Decompressed file size ~6 MByte. - eng. vs. eng. games on my Dual systems with ponder=on from the latest four years. - CC-Computer chess database (from CC-Calendar, games 1992 up to today). - the GM database by Olivier DEVILLE. - few special games I collect in the latest years. - few "killer opening variants" I collect in the latest years. - no comments, ELO and other information in PGN file. A fantastic polyglot Opening Book, designed specifically for DeepSaros.